This past September my husband and I celebrated 34 years of marriage. It has not always been easy – what marriage is easy? We’ve brushed up next to divorce a few times and weathered being separated for almost a year. Throughout our marriage, we’ve had our share of disagreements, arguments, and fights – some reasonably civil and others involving throwing things, yelling, and other uncivil behaviors. In short, we’ve fought poorly many, many times. I can tell you all about how to fight badly: Expect your spouse to read your mind. Never give in. Demand your own way. Use the silent treatment. Drag up old grievances. If you’re married, you can probably add a few choice habits of your own – it seems we all know how to fight ugly without even trying. But to fight fair – that takes effort. It times time. It takes humility, grace, and love. It’s hard, oh so much harder than fighting ugly is, but so worth the effort. I encourage you, whether you’ve been married 6 weeks, 6 years, or 56 years, to take the time – always! – to fight in the right way. What is the right way? It’ll be helpful to think of the right way to fight as answers to the basic “W” questions (and one “H”): who, what, where, when, why, and how. I’ll be looking at these answers over the next three days, as we consider how to fight in our marriages. Fighting for our marriages – against a society that devalues everything sacred – is a topic for another time. 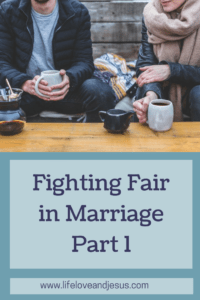 NOTE: This series on fighting fair in marriage is not designed to address serious problems such as physical or sexual abuse, alcohol or drug problems, adultery, or issues with law enforcement. I am not a marriage counselor, just a long-time married wife who wants to share what I’ve learned. When you fight in your marriage – keep it there. Don’t drag in acquaintances, friends, or family. I’m not talking about actually having others present during your arguments – try to avoid that at all costs! By ‘bringing them in’ I mean sharing the details of your private relationship inappropriately. For example, if your husband won’t help with the household chores and this is a constant source of arguments in your marriage, you can seek advice from other (married) women without badmouthing your husband, but don’t try to make them choose sides. This, I’d like to say, was never a problem for me. But, in fact, it was. I married young (I was 20) and did not have many close friends. Although we moved far from home, I called my mother as much as I could afford, and always shared with her the details of our disagreements. She, of course, told dad. The end result? My parents didn’t like my husband much the first several years of our marriage. They tolerated him, which was easier considering we never lived close. But, especially when things were really rocky, they didn’t like him because they took my side of things. Lesson learned – keep arguments private, but share the good stuff. DEFINITELY, don’t involve your children!! Ever. No matter how young or old or grown they are. Never! DO involve your marriage counselor if you are in counseling, your mentor couple if you have one, or even your pastor if he’s helping you sort through some marital issues. On a side note, never be ashamed to ask for help in your marriage – we all need it at times. My best advice, based on doing it wrong so many times that I finally learned to do it right, is to pick your battles. How important is it to you that your spouse (1) takes out the trash every night, (2) gives the littles their baths, or (3) supports your desire to get a college degree? You may have to choose one of these scenarios as worth fighting for and be willing to compromise on the others. Remember your priorities and purpose in choosing your battles. Will ‘winning’ the fight cause you to lose the war for your family? Some do’s: (1) fight for teaching your children the truth about God, Jesus, sin, and salvation; (2) fight for maintaining your personal spiritual relationship with the Father; (3) insist on unity in parenting, but not uniformity; (4) safeguard your marriage relationship by prioritizing it above everything except your faith. Do you get the idea that the big ideas are the ones most worthy of fighting for? Keep your eyes on the end game, and compromise wherever possible. Along these same lines, you might want to work on having a family mission statement. This was one hope I had for my family early in our marriage that never materialized. Honestly, my husband never knew until recently that this had been a desire of mine. I never shared because it didn’t seem important enough to rock the boat. I was wrong. I think having a family mission statement would have helped us navigate dangerous waters better than we did. Instead, our two sons endured much fallout from our tumultuous marriage. We pray for their own marriages constantly, not because they have rocky relationships, but because we gave them a rocky example. If you are interested in formulating a family mission statement, I recommend this post from theartofsimple.net. You can also google ‘family mission statement’ and find many other resources. I just happen to have used some resources and suggestions from theartofsimple.net, and know this is a quality site. To review: WHO is in the argument: just you two, and possibly a counselor. WHAT do we fight about: important issues, not small stuff. Next, we’ll look at our next two “W” questions: WHERE and WHEN to fight in your marriage. Such good advice. Wish I’d learned these lessons sooner!